The two Chinese priests were, one old and one young: Father Francis Wong had been twenty-five years ordained, Father Kwok only five. Father Wong has already come into this story, for it was he who captured by the Communists with Fathers Bianchi and Robba in Swabue in Christmas, 1937, when all were condemned to death. He, as a Chinese, was singled out for death by the most barbarous form of torture known to them, and he was only saved by the courageous intervention of Bishop Valtorta and the help of the Governor of Hong Kong. He had been in the district of Swabue for ten years, but after his dramatic rescue he was transferred to the Saikung area, and put in charge of the church in Tailong and of the four surrounding missions. 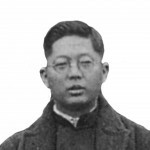 When, with the approach of the Japanese attack, the Italian priests in Hong Kong were interned, and consequently Father Caruso and the other priests who were working there had to go Father Wong was in charge of all the New Territory area and he had as his assistant Father Rene Kwok. by Father T.F. Ryan, S.J.